Today is a day for bad cycle lanes and good cycling actions. 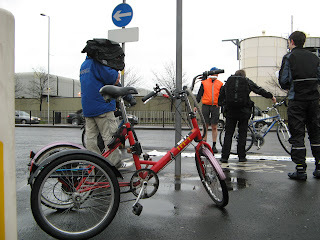 Greater Manchester Cycle Campaign invitied me to attend a crap cycle lane which I am sad to say is the Hulme Ward. By the Princess Parkway on the junction of Radnor Street is a 3 metre cycle lane that is more of a liability than of any use. It is useless, unnecessary and puts cyclists and pedestrians in direct conflict. 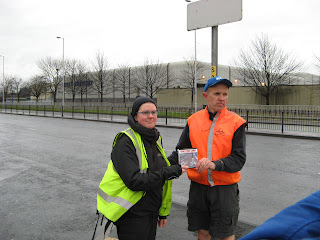 Vincent Walsh from GMCC presented me with the Crap Cycle Lanes book, which I have been asked to pass on to Manchester City Council's Cycling Officer. We had a brief discussion about the transport plans for Manchester and agreed that I should ask for a joint meeting with Council Officers to scrutinise the crap cycle lanes and look forward at the TIF (Transport Innovation Fund) bid to ensure that cycling is placed at the heart of the future transport plans for the city. The event was covered by both the Manchester Evening News and Channel M, so look out for their coverage too. And this evening at 6pm it will be time to get on your bike again for the monthly Critical Mass, meeting from 6-630pm for a cycle round the city centre to celebrate the bike and all things cycling.